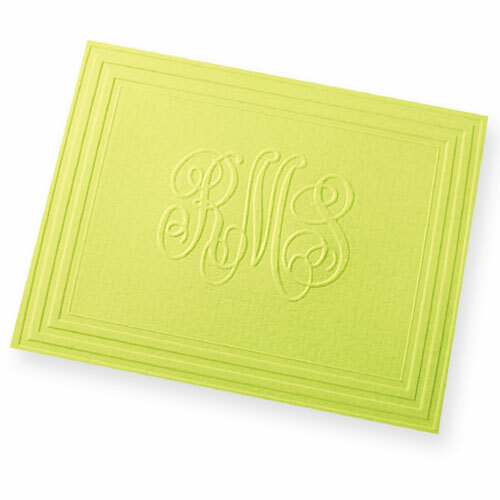 Clark Stationery - Embossed Graphics - For many more stationery choices click Embossed Graphics to go to our sister site to order. Item Name: For many more stationery choices click Embossed Graphics to go to our sister site to order. A personalized gift featureing a sophisticated charm, this note extends West Coast warmth in a variety of beautiful shades. Features a 1 1/2 inch monogram. Size: 5" x 4". Papers: (outside/inside colors) Navy/white, mocha/white, red pepper/white, black/white, pine/ivory, citrus/citrus. Return Address available on envelope.